Last night Maryse and I took our semi-regular "let's relive our youth" trek to the Scotiabank Place and took in a Coldplay concert. They were excellent! 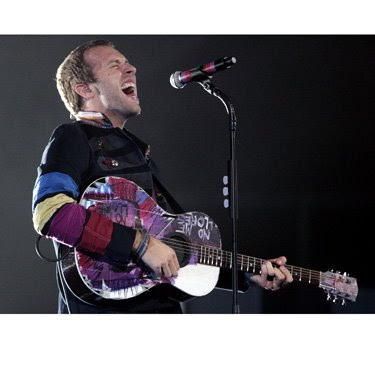 Preceeded by a forgettable opening act (Stars, who Wikipedia refers to as "a Juno Award nominated Canadian indie pop band") Coldplay squeezed all their hits and some new stuff into about an hour and-a-half. We had fairly good seats, three rows up in the 200 level to the side of the stage. Not near enough for close-ups but I got some decent pics from my point and shoot camera. The band began at centre stage, used the aprons at either side of the stage throughout the concert, did a short acoustic set below us on the stage-left apron and -get this - ran to the far end of the arena where they performed two acoustic numbers in front of a level 100 box! All in all, a highly entertaining evening from Chris Martin and his band mates. 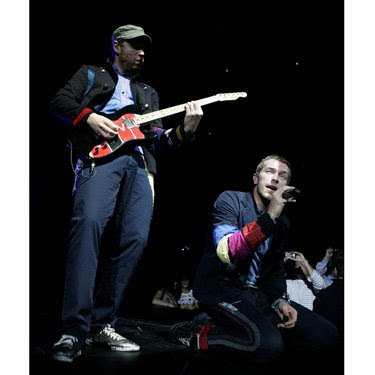 Coldplay's website can be found here and their Wikipedia entry here. And here's Lynn Saxberg's review of the concert in this morning's Ottawa Citizen.